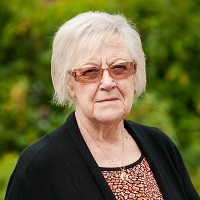 Larry is a retired special needs teacher who became a trustee in the late 1980’s and she has adopted the role of fundraiser on behalf of Jubilee House for many years. Her daughter lives at Jonquil Close, which provides residential care for adults with learning disabilities. She was so proud to receive the award for Volunteer of the Year at Hertfordshire Care Providers Awards in 2012. Larry currently sits on the Operations committee.